We have had dozens of comic book movies over the last decade or so and it’s always the original ones which stand out and raise the bar for others to follow. This years Captain America is taking the lead in originality by setting a modern day comic book movie in the 1940s basing the whole movie around the first Avengers origin. So far the movie has been set in locations all over the place including Super Robot Mayhems home town of Manchester got some air time. The latest picture comes thanks to the LA times and features the faithful sidekick James “Bucky” Barnes. In the comics Bucky was a Jimmly Olson type figure he even had a camera and ran with Captain America taking pictures of the all American hero. Bucky is going to be played by Sebastian Stan (Gossip Girl, Kings) and was apparently set for the lead role of Steve Rogers but Chris Evans came along and just had the perfect look and aura for Captain America. In our story, Bucky is already in the service, he’s already joined up and is being sent overseas while Steve is still struggling to get in the army. That’s different than what you may have read in the comics. It adds a nuance to the relationship that pays off later. They’re closer in age, too – they’re virtually the same age. That’s not the case at all if you go back to the old comics. 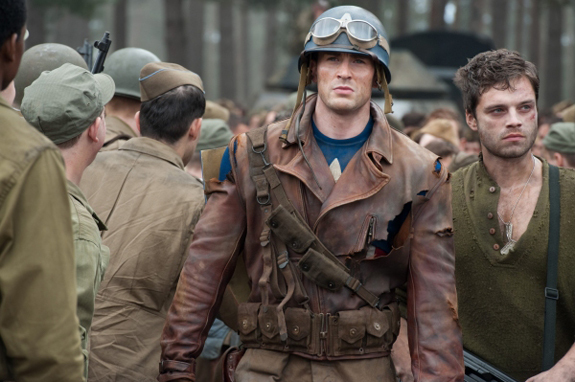 In Captain America: First Avenger, Steve Rogers and Barnes are orphans and grow up almost as brothers. Rogers is too sickly to enlist in the service and instead he volunteers for a dangerous and secret experiment that might make him the first of an army of super-soldiers.